The Latest with David Jay: Great trip! Yesterday was fantastic! I absolutely loved this PPARI group and the whole event was just amazing! Everyone really embraced the FREEdom principles and I'm so excited to see these photographers succeed in a whole new way! I'll be back out here in September for an even bigger conference for all of New England so if you're on the East Coast be sure to come! After the conference I got to connect up with a wonderful couple of mine! 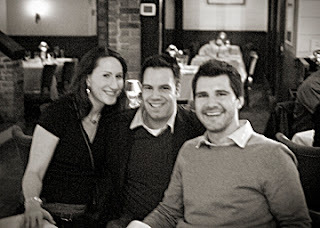 Justin Marantz and Mary Bess and have dinner and chat about their upcoming wedding in CT! So fun!!! Also, if you were at the conference please send me photos! I have a couple but I want to keep them all and put them up on my blog. Sounds like it was a nice conference. Where will the conference be in September? I'll try my best to be there. DJ - Your conference was AMAZING. If anyone has the chance to see DJ's Get Free talk - DO IT! Thanks for making me look at my business in a whole new way. I'm glad you had a good time here in New England DJ. I know why Justin and Mary are smiling... you are their wedding photographer (ha, ha). Thanks again for everything DJ...we had an awesome time! I hope you had a very safe trip to Chicago, and don't forget to get some rest! We'll see ya in May!